Ismary Calderon makes courage look easy, even though she describes herself as shy. During her first year at John Jay, she started an internship with the Unaccompanied Latin American Minor Project (U-LAMP), and ever since then, she’s been learning how to use her voice as a leader for change, especially in the field of immigrant rights. Through the internship, Calderon served as a pro-bono translator and interpreter to help children communicate with immigration lawyers. “It was life-changing,” Calderon says. As an undocumented student with family in both the U.S. and Mexico, the work hit close to home. Calderon soon realized that she was driven to complete her education in order to help people in need. 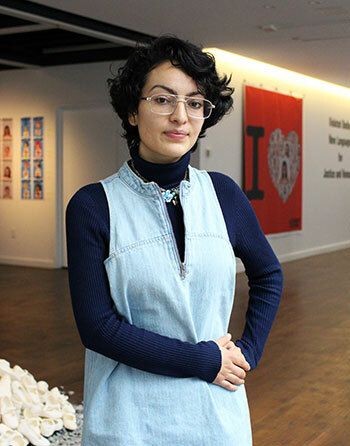 During her sophomore year, she became part of CUNY Dreamers, a student-led organization dedicated to supporting all CUNY students regardless of immigration status. Since then, she has become more involved in local and national activism, joining the John Jay Dreamers and frequently traveling to D.C. with the group United We Dream to support Deferred Action for Childhood Arrivals (DACA), the federal immigration bill that has come under fire under the current administration. In D.C., she used creative ways to get the attention of legislators, even setting up a cage-like structure using PVC pipes to symbolize feeling trapped by harsh immigration policies. That action, and others that Calderon was involved with, made national headlines. Calderon says that thinking of the children that she provided legal help to with U-LAMP motivates her to continue her activism. 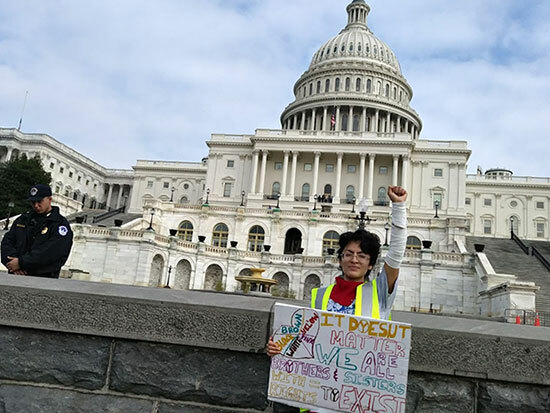 “Being undocumented made me see that I could be either person—I could be the lawyer in the future, or I could be the person in the deportation proceedings,” she says. Last year, Calderon switched her major to Spanish in order to perfect her translation skills, so she can continue to work with immigrant communities. But Calderon continues to indulge her love for science by taking Environmental Studies classes and encouraging her classmates to think in greener ways. As someone who grew up taking walks on the Staten Island shoreline, she is committed to using what she learns to promote protecting the environment.